The crest is that of Sutton for Sir Richard Sutton, 2nd Bt. (1799-1855). Sir Richard Sutton was an influential patron of the Royal goldsmiths Rundell, Bridge and Rundell. He commissioned several important works in silver from them, much of which was offered in the sale of his collection at Christie's, London, March 31, 1976. Other items from the Sutton collection were offered at Christie's, London, May 11, 1994 and March 5, 1997. Most recently, a magnificent pair of silver-gilt candelabra, Philip Rundell, 1820 bearing the arms of Sir Richard Sutton sold at Christie's, London, July 5, 2000, lot 4. A Theocritus Cup of 1812, by Paul Storr for Rundell, Bridge and Rundell, was presented to King George IV from his wife Queen Charlotte and remains in the collection of Her Majesty the Queen, exhibited at The Queen's Gallery, London, Carlton House, the Past Glories of King George IV's Palace, 1991, cat. no. 86. 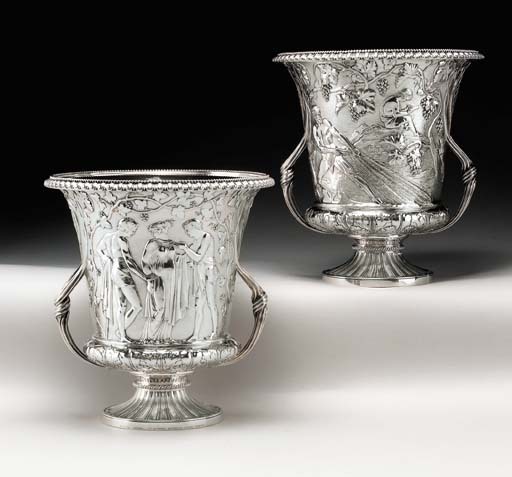 A pair of Theocritus Cup wine coolers with plain foot-rims by Rundell, 1814 and 1820, sold at Christie's, Geneva, May 15, 1985, lot 73.